Amid all the talk of playing styles and footballing philosophies, Cobblers manager Keith Curle says he does want his players to have ‘the freedom to express themselves’ on the pitch - providing they also execute the ‘fundamentals’ out of possession. Curle’s style of play has come under close scrutiny in recent weeks, particularly with results taking a turn for the worse, but he hit back after last Saturday’s defeat to Port Vale when he suggested his players were not capable of playing anything other than ‘ugly’ football. There was a brief period earlier in in the season when Curle switched system to 3-5-2 and encouraged his players to pass the ball out of defence, but that approach backfired and was swiftly abandoned. However, whilst Town’s football has hardly been swaggering in recent weeks, it has helped them go from relegation candidates to a safe position in mid-table, though Curle will be expected to introduce a more attractive style once he has his own players in next season. Ahead of tomorrow’s trip to Notts County, Curle said: “We’ve been reiterating the principles. A lot of it about decision-making and picking the right option at the right time. “I want players to go out onto the pitch with the freedom to express themselves in the right area. That won’t change but, within it, there are fundamentals that players have to do to make sure we nullify the opposition. 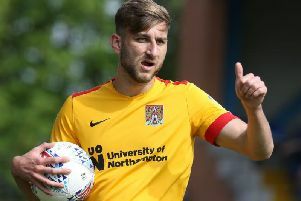 Cobblers had a stroke of luck against Port Vale when an offside-looking Sam Hoskins opened the scoring just five minutes in, but they were then on the wrong end of a contentious decision as Charlie Goode was harshly penalised for a foul on Tom Pope, who then scored from the spot to win the game. Curle believes those two incidents were a reflection of his side’s difference in performance from first-half to second-half, and he says it’s up to them to make their own luck. “You get peaks and troughs throughout a season where things go your way and things go against you,” He added. “Saturday was a game where things were going for us. We scored a goal that was offside and that shouldn’t have been allowed because I think Sam Hoskins was offside so I felt things were going our way.